I’m partnering with Buitoni® to bring you today’s recipe. All opinions are my own. Thank you for helping me work with companies I love! 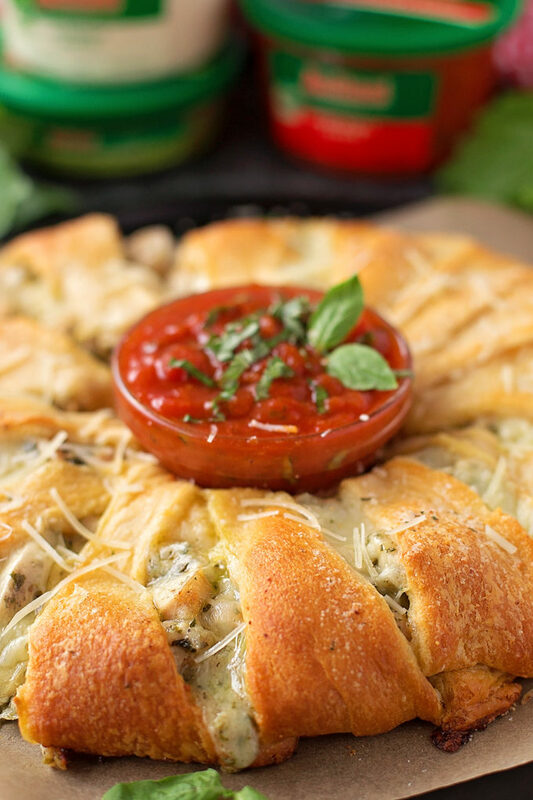 This Cheesy Chicken Pesto Crescent Ring is the perfect party appetizer or main dish. 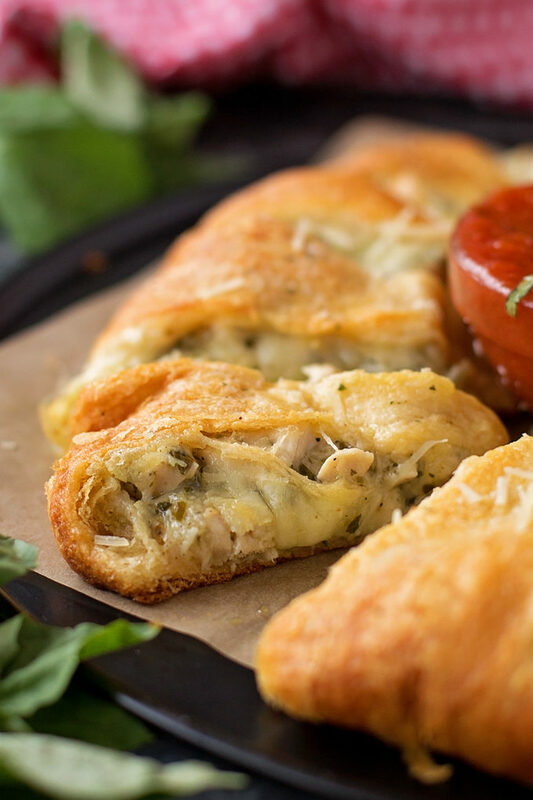 It’s stuffed with cheese, chicken, Buitoni Pesto, and Buitoni Alfredo. Easy & delicious! Life is really busy for our family right now. Between all of the holiday prep and get togethers, we’re always in a rush. I’ve also been avoiding the grocery store because 1. I hate how crowded it is this time of year 2. The thought of grocery stopping with three kids is exhausting (although I have successfully done it) and 3. I don’t want people constantly asking me if they can take a peek at our newborn. With that said, I’m constantly scavenging through the fridge and pantry to find something to throw together for dinner. Bonus points if it’s quick AND easy! 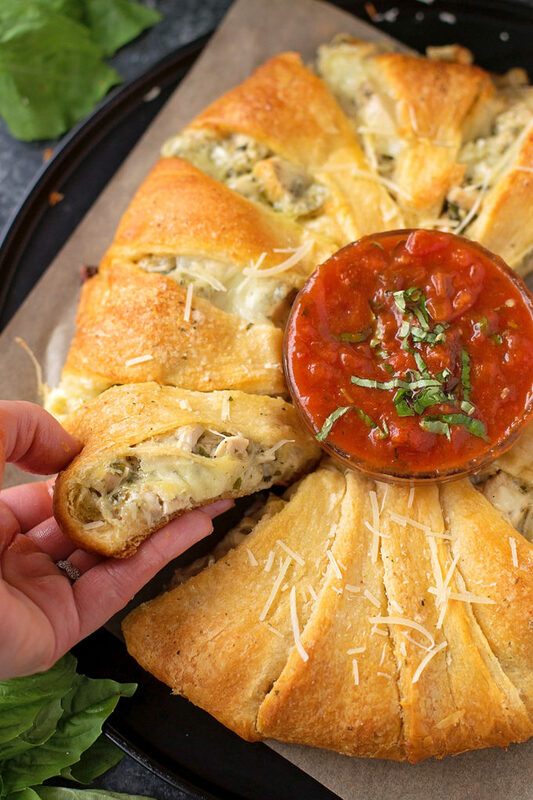 This Cheesy Chicken Pesto Crescent Ring was the perfect solution to our dinner time struggles. It only takes 40 minutes to make (half of which is baking time) and 8 ingredients. Plus, it can be simplified by using pre-shredded cheese, rotisserie chicken and store-bought refrigerated sauces like Buitoni. I grabbed three of the Buitoni freshly made sauces: Creamy Alfredo, Basil with Pesto and Marinara. For the filling, I mixed together a portion of the mozzarella, parmesan, chicken, pesto and alfredo. That’s right, only 5 ingredients! I chose Buitoni sauces over jarred sauces because they have a fresh taste and they’re made with no GMO ingredients. They also happen to taste similar to my homemade sauces, which is pretty darn impressive. I rolled out the crescent dough and formed a sun shape on my baking sheet. 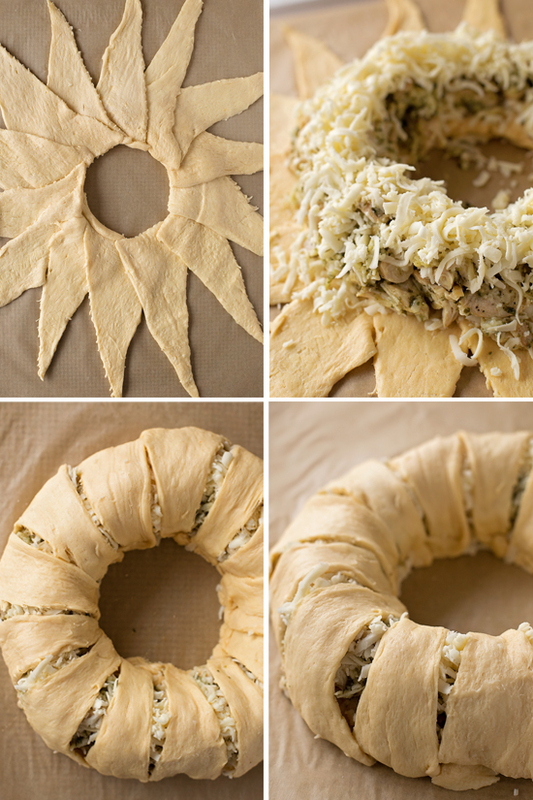 I spread the cheese and filling over the centermost part of the dough, then took the tips and folded them over to create the ring. It may look difficult but I promise it’s not! I brushed the top with melted butter and garlic powder. It gave the crescent dough a little extra flavor. After letting the ring cool for about 10 minutes, we sliced it up and started dunking. The marinara sauce was a nice added extra. Again, it tasted so much better than the jarred stuff, and it was way easier than making a vat of homemade sauce!! This was a quick and easy meal that the entire family loved. We’re obsessed with pesto so this ring went quickly. It was the perfect size for a family of four. 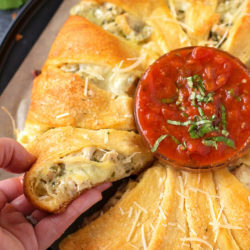 It would also make a great party appetizer and could easily feed up to 8 people! 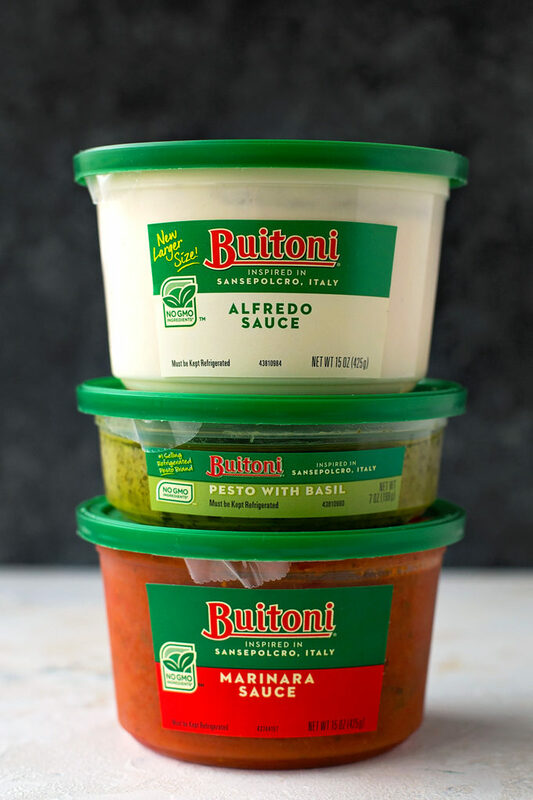 Next time you’re at the store make sure to grab some freshly made Buitoni sauces in the refrigerated section… you never know when you might use them! Want more recipe inspiration? Make sure to visit Buitoni.com. 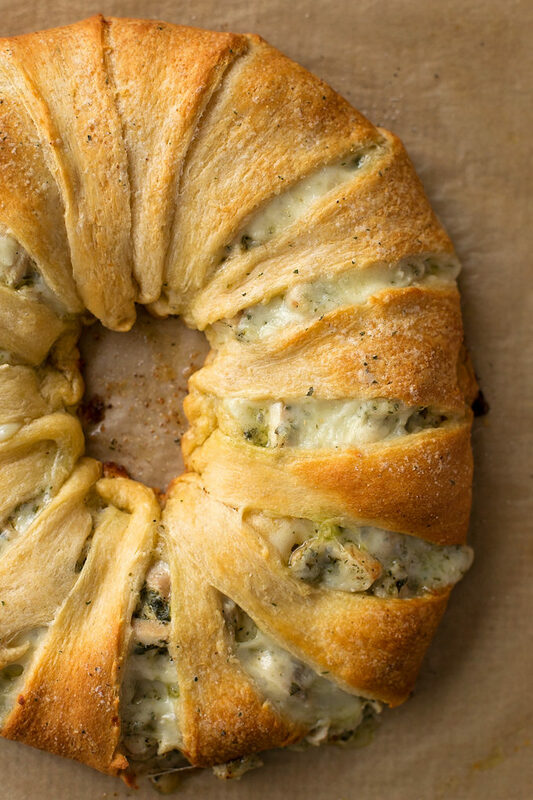 This cheesy chicken pesto crescent ring is the perfect party appetizer or main dish. 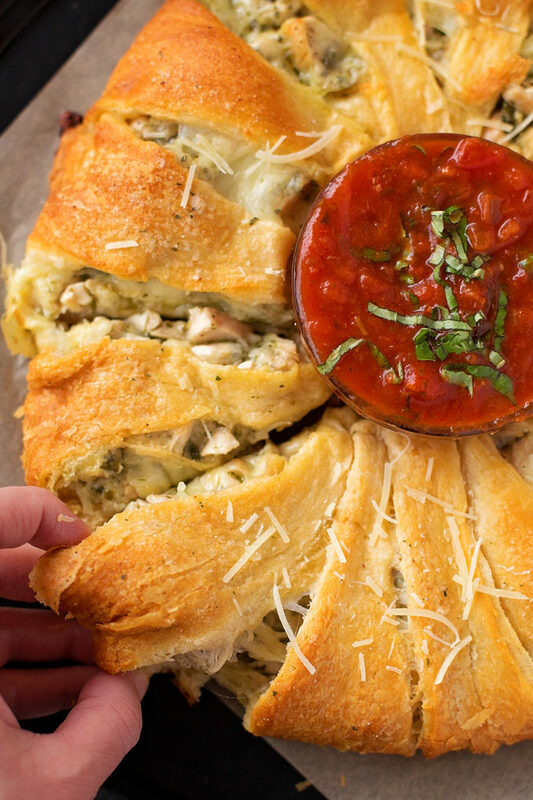 It’s stuffed with cheese, chicken, pesto, and alfredo. Easy & delicious! 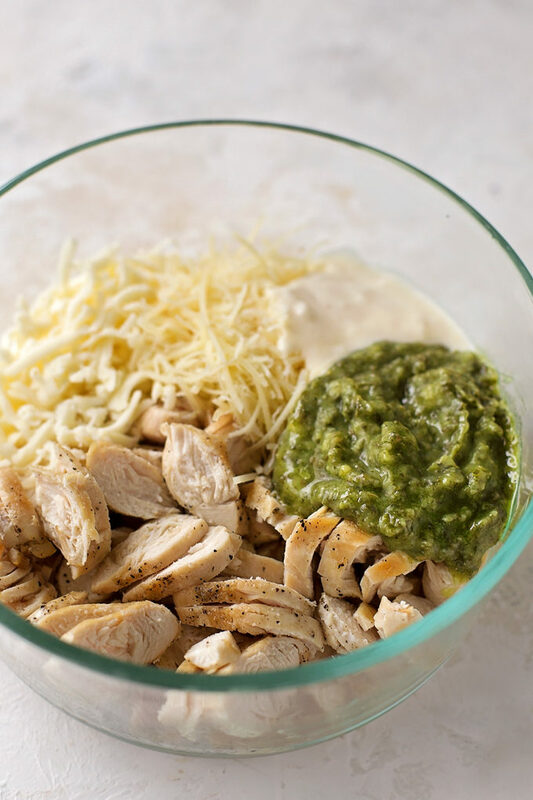 In a medium bowl, combine 1 cup of mozzarella with the chicken, pesto with basil, alfredo, and parmesan. Mix just until combined. Unroll both cans of crescent dough and separate into 16 triangles. On the prepared baking sheet, arrange the triangles (overlapping the dough) in a ring to form a 4-inch circle in center. Sprinkle 1/4 cup of the mozzarella over the inner most part of the “sun.” Spoon chicken mixture over. Top with remaining 1/4 cup of mozzarella. Take the tip of each dough triangle up and over the filling, tucking it under bottom layer of dough to secure it. Repeat around the ring until entirely enclosed (it’s ok if some of the filling shows a little). Brush the top of the crescent ring with melted butter, then sprinkle garlic powder over top. Place in the oven and bake for 22 to 25 minutes or golden brown. Remove from the oven and allow to cool for 10 minutes before cutting. To serve, place a small bowl with marinara in the center of the ring. You can use pizza dough too. Cut the dough into 16 triangles. Does the pesto get mixed in with the chicken, alfredo etc. it isn’t mentioned in the instructions.